When I heard about this new documentary that showcases the work of seven successful landscape architects, all from California, I have to admit it didn’t exactly sound like the most exciting film. But I also had a feeling I would dig it. Since I couldn’t make any of the current screenings, I was really lucky that the filmmaker sent me a copy to preview at home. As I’ve said before, I’m not an expert gardener, and am certainly not a landscape designer. I am fascinated, however, by the power of outdoor spaces. This film offered an inside look at how some of the top professionals in the field today create spaces, from private gardens to public parks, that evoke feelings of joy, peace and hope. My favorite part of the film–besides being able to walk through some of the most beautiful gardens in our state with these literally ground-breaking women–was to hear how they think and feel about their work. What motivates them. How they got into the field. What they care about the most. Simply put, if you love gardens, you will enjoy this film. Hands down. A total visual and intellectual treat. You can order the DVD or hope it shows up in your area, or on Netflix, or PBS. It’s a shame the photos here do not do justice to the overall gardens. Many of the gardens are in affluent, private residences, so this might be your only chance to visit them. For instance, Isabelle Greene‘s, The Valentine Garden, was one of the first Zen, xeroscape gardens in the country. Greene, the granddaughter of one of the Greene and Greene brothers of Gamble house in Pasadena fame, is the apparent grande dame among the featured women. In the film, you get the whole tour of her innovations here, and see how she used succulents, gravel and tiered sections of bold color to create a stunning, water-saving garden in Santa Barbara in the ’80s. 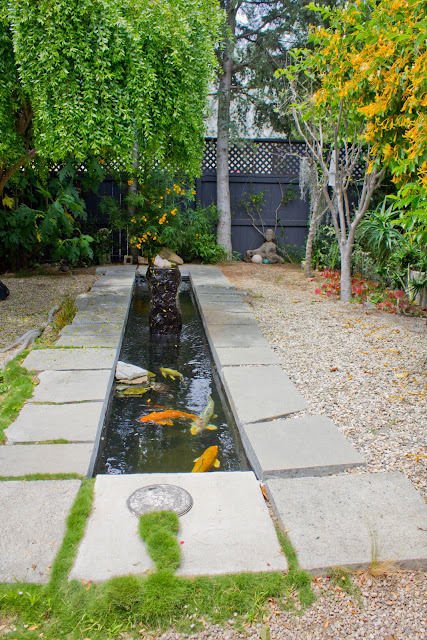 Here’s a pool Greene sunk into a garden space in Santa Barbara called The Lovelace Property. The owner wanted a 60-foot lap pool, and at first Greene had no idea where to put one in this pristine oak woodlands. But then she came up with the idea of this meandering pond design, where the owner could still swim his laps without ruining the wild feel of the property. Greene, who worked on the Lovelace property for 35 years, explained how California has a history of “forced landscapes,” because many transplants brought their gardening habits and priorities that included full seasons and lots of water. “I don’t believe in struggle,” she said, which led her to plant succulents and natives that require little maintenance. These women are not just gardeners, or even architects, but they are pioneers, artists, truth-seekers, and advocates for our world and future. If only we could all afford their brilliant assistance with our own homes and yards. But I think this film shared many ideas and inspiration on how we all can apply many of their progressive values, techniques, and dreams into our own dirt! All are advocates, taking a fierce stand for nature, art, neighborhoods, and the future. 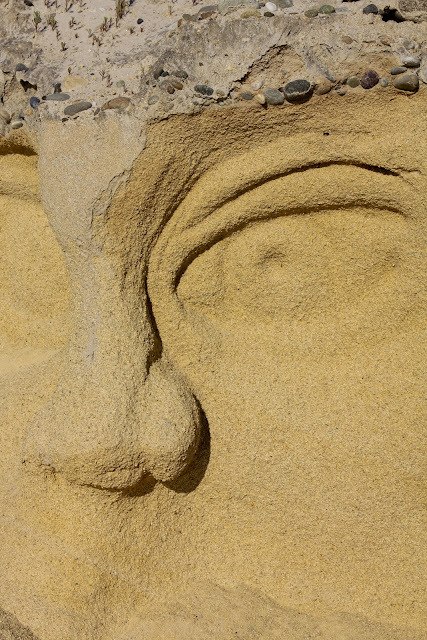 All are preservationists of nature and history. All believe in both beauty and sustainability. All believe gardens should evoke emotional experiences and pleasure on some level. Most support the idea that gardens should serve as habitats to support local flora and fauna. All are dedicated to making a difference with their lives and work. Here are the names of the other six, award-winning landscape designers featured in the film: Mia Lerher, Andrea Cochran, Cheryl Barton, Katherine Spitz, Pamela Palmer, and Lauren Melendrez. Each had her own unique philosophy and focus, but all were articulate, beautiful and fierce in their own way. For instance, Mia Lerher is working on revitalizing the Los Angeles River, a 32-mile-long concrete basin that has the potential to transform the urban landscape. city,” she said. How bold to plant sycamores along our streets! I wondered if the film would have a feminist message. Other than only spotlighting women designers, it briefly backgrounded how historically women were considered good mainly for tending “flowers,” but were often over-looked as scientists, artists, architects and advocates in the field. Thanks to these and other talented women–and this inspiring film–this is changing! Click HERE to watch trailers of the film. Previous Post: Big Red Sun RISING! I'm running to Netflix to check if it streams. Thanks so much for the review. Thank you for an AWESOME review. You really get the film! And Denise, sorry, Women in the Dirt is not yet on Netflix. But please ask em! 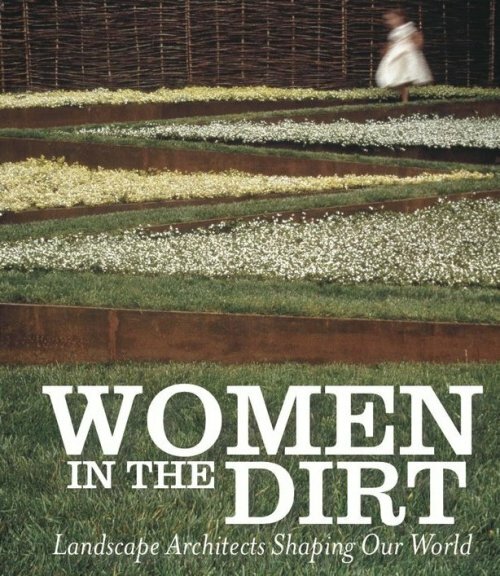 Meanwhile, you can join our mailing list if you like: http://womeninthedirt.com.